If you are an Ancestry.com member or paying subscriber, you may not fully understand a feature of the website: periodically records, and even entire record sets, can and do disappear! Seriously. And it isn’t just Ancestry that does this. Many of the major genealogy websites, even free sites like FamilySearch, have removed records and record sets in the recent past. So what’s going on? What you may not realize is that the record sets are licensed to vendors like Ancestry with specific terms as to how they can be used and for how long they can be used by Ancestry members and subscribers. Here’s a prime example that many of us who research in the Cook County, Illinois area understand: For many years, a researcher could access birth, marriage, and death certificates with images on ancestry.com and family search. Then suddenly one day proof! These records were gone and eventually replaced only by an index. So what happened? It turns out the Cook County let the licensing agreement with ancestry and family search expire without renewing the license their plan was to create their own site where they would sell the certificates for $15 each. This was well within the rights of Cook County since they are the owners of the documents and the document images. And if you look at it from the local or county government perspective they are always looking for ways to monetize assets and bring in income to avoid raising property taxes, other taxes, and other fees paid by its citizens as well as visitors. Some licenses are exclusive. This means that only Ancestry (or some other site) will be the provider for these records. Typically it costs more for the vendor to acquire a record set through an exclusive license, but doing so allows them to remain competitive with other genealogy vendors. Often genealogists subscribe to more than one genealogy website in order to access exclusive records. Most licenses have an end term or an end date. Despite this, almost 80% or more of the licenses are typically renewed at or near the end of term. This means there is no service interruption for Ancestry subscribers and members who use those records on a regular basis. Record sets are missing from the Ancestry Library product. If you have ever used the library version of Ancestry at a library or repository, you may notice that some record sets are missing. Or you may notice that you can’t save the images whereas you can save the same images when using Ancestry at home. Some licenses are structured defining what the user can and cannot do with the records depending upon the product version of the genealogy website. The same issue exists with FamilySearch: you may have noticed that you can’t access a record image on familysearch.org from home, and you are told to visit a local Family Search Center or the Family History Library in Salt Lake City to access the image. Again, this all has to do with the specific license for that specific record set. There licenses for many types of information that we use as consumers either for free or paid through a subscription. A license regulates who retains copyright on the content, who has permission to sell the information, who has permission to use the information, and in what manner there are allowed to use the information. If we didn’t have licenses, it would be very difficult to enforce copyright and intellectual property laws. A license is often a way of monetizing intellectual property while at the same time protecting copyright. – Not to distribute, republish, or sell significant portions of any Ancestry Content. See Ancestry Terms and Conditions, https://www.ancestry.com/cs/legal/termsandconditions. All content found on this site (including visuals, text, icons, displays, databases, media, and general information) is owned by us or licensed to us. You may view, download, and print content from this site only for your personal, noncommercial use, or for your use as a volunteer indexer in connection with the FamilySearch Indexing Program pursuant to the FamilySearch Indexing Program Terms and Conditions or the FamilySearch Indexing Software License Agreement. In addition to the foregoing, unless otherwise indicated, content may be viewed, downloaded, or reproduced by media personnel for use in traditional public news media. You may not post content from this site on another website or on a computer network without our permission. You may not transmit or distribute content from this site to other sites. You may not use this site or information found at this site (including the names and addresses of those who have submitted information) to sell or promote products or services, to solicit clients, or for any other commercial purpose. Notwithstanding the foregoing, we reserve the sole discretion and right to deny, revoke, or limit use of this site, including reproduction of site content. It is not our responsibility to determine what “fair use” means for persons wishing to use content from this site. That remains wholly a responsibility of the user. Furthermore, we are not required to give additional source citations. Also, in no case do we guarantee that any content on this site is legally cleared for any use beyond personal, noncommercial use. Such responsibility also ultimately remains with the user. However, we do maintain the right to prevent infringement of our content and to interpret “fair use” as we understand the law. So what does this mean to you as an Ancestry or FamilySearch user? See below for my tips on the first thing you should do when you find a record that you want to use as part of your genealogy research. Basically, I recommend that you immediately save a local copy and don’t assume that attaching a record image to your online tree will ensure that you will always have that image available. Can I Find Out Which Record Sets Will Disappear? The truth is you really cannot find out from Ancestry or any other genealogy website which record sets are scheduled to disappear or may have disappeared recently. When you think about it, this makes sense, at least to me as a business owner. I remember when I worked for big law firms we always had a big announcement when we opened a new office overseas. But we never announced the closing of an office! It works the same way with the big genealogy vendors. You may see press releases, blog posts, Facebook announcements, advertisements etc. as to new record sets or additions to an existing record set. But is very rare that you will see a genealogy vendor admit to getting rid of a database. If you want to see what Ancestry has added recently they do have a web page available, called Recently Added and Updated Collections (http://www.ancestry.com/cs/recent-collections). Unfortunately, we are left to having other genealogists, especially genealogy bloggers, report the disappearance of record sets on Ancestry and other genealogy platforms. 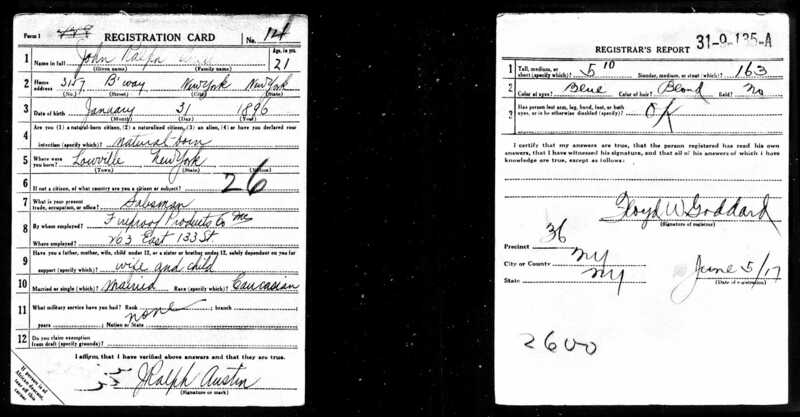 World War I Draft Registration Cards, 1917-1918,” digital images, Ancestry (http://www.ancestry.com: accessed 29 Oct 2016), John Ralph AUSTIN, Draft Board 135, New York County, New York; citing World War I Selective Service System Draft Registration Cards, 1917-1918, NARA microfilm publication M1509; Family History Library Roll No. 1766376. I treat that record as if it were the only time I could access it. How many times have you researched late at night only to discover that you can’t find that record or website in the morning? As soon as I find a record, whether or not it will prove or disprove one of my research data points, I go and save the image if an image exists, to my local hard drive. Now I move the newly named file from the Downloads directory to its proper place with my other genealogy files. Once I have secured the image I can then complete the research information on my research log for that record including the source citation and evidence evaluation. I also make sure that that image is part of my backup plan for all of my genealogy data. The procedure above is the safest way to use Ancestry and any other record provider. If I don’t grab the image right away and give it a proper name right away I tend to get lazy and tell myself I will do it later and later never comes. What is your action plan for saving record images from online genealogy websites? If you haven’t been saving these records on your computer, do you have a plan to go back and grab them now? 2 Comments on "Don’t Make this Big Mistake with Ancestry.com"
I go and save the image if an image exists, to my local hard drive. Question: How do you save to your hard drive please? If anybody ever sees a digital image they want to copy and save, but the website won’t allow a download, take a screen shot. On my desktop computer I press the “PrtScn” button, which copies everything I see on my monitor. Then I “paste” that into my graphics program. If there’s, say, a birth certificate, that, at the size you want, less than the entire document can be seen at once, take a first screen shot showing the top of the document, then after saving that, scroll down to show the bottom portion of the doc, take a second screen shot and save that. Then you or somebody you know can crop one screen shot image, then put it on top of the other image in the perfect spot, so the entire document image is in view. Then crop the entire screen shot image to just the document image, and save it.